The design of Dispersy is modular and extensible and lets applications define their own overlay types for specific goals. In Dispersy all nodes communicate in one or more overlays which are called communities. An overlay is an additional network built on top of an existing one, most commonly the Internet. By defining a community, an application can determine which messages are going to be used, and which need to be synchronized. The body of a message is application specific, but its headers are added by Dispersy and can contain if and to whom this message needs to be synchronized, the id and or signature of the creator, etc. After defining a community type, a peer needs to instantiate it. Instantiating a community requires a peer to generate an cryptographic identifier for it. This identifier has to be known to all peers who attempt to join this instance. Dispersy communities are completely separated from each other, through including the identifier of the overlay in the messages. After joining a community, peers synchronize by advertising their locally available messages using a Bloom filter. Dispersy maintains a list of peers for each overlay, this list contains peers which are deemed to be connectable. 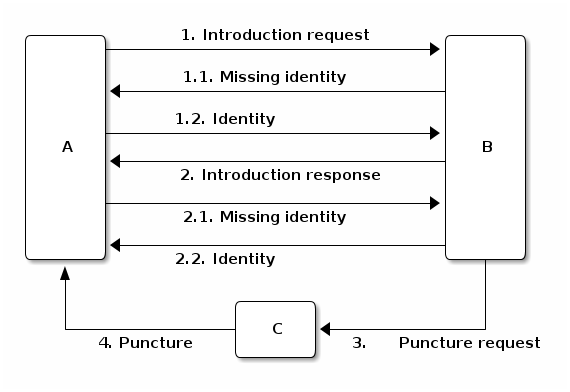 Initially, the peer list is empty, requiring a peer to initiate the peer discovery algorithm, i.e. bootstrap. For this it uses trackers, which must not be behind a NAT-firewall. Trackers maintain lists of peers for several overlays, and return these upon request. After a peer has populated its peer list with initial peers, it can use those to discover others and selects a random peer to perform a synchronization step with. Nodes that have been introduced. The node that is chosen for the next synchronization step is based on the probability of the different groups. After the group is chosen, Dispersy chooses the oldest node from that group to make sure the NAT-firewall timeout does not expire. Trusted nodes only consists of the tracker nodes. The tracker nodes have a probability of 1% to be selected. This is to not overload the tracker nodes, but still keep connecting to them to clear unwanted nodes. Contacting a trusted node will completely reset the candidate list, thereby removing any attacker nodes which could be present. This group contains nodes that have responded to our introduction-request message. This group has a probability of 49.5% to be selected. This group has two subgroups. One group contains nodes that have sent us introduction-request messages and the other group contains nodes that have been introduced to us by nodes we have successfully connected to in the past. Both of these groups have a probability of 24.75% to be selected. Both these groups contains nodes that might possible be malicious. The probability approach to picking the new node to communicate with is to make sure that even is this group becomes bigger the number of nodes chosen from this group stays the same. peer C sends peer A a puncture message to puncture a hole in its own NAT. These four phases constitute a step, and multiple steps constitute a walk. By walking, each peer discovers a set of known peers which we define as its neighbourhood. We integrate in Dispersy a NAT traversal technique able to puncture 77% of NAT firewalls. Not puncturing these firewalls would prevent up to 64% of peers from receiving any synchronization requests. In Dispersy, each peer needs to be able to verify the identities of other peers because we use a right management mechanism. According to our right management mechanism, each peer has different access rights based on the history of rights granted and revoked. To this end, we use public/private key pairs to allow peers to cryptographically identify themselves. The public/private key pair of a peer represents a single Member instance which signs or verifies the messages created by the peer itself or other peers, respectively. Ideally, we want to assign one IP address to each member, and have this mapping be the same for every peer in the system. However, an IP address may change between successive sessions or some peers may assign the same IP address to a Member (i.e. someone behind a symmetric NAT uses different ports for communication with other peers). For those reasons, besides a Member (i.e. the cryptographic key) we use an additional instance, named a Candidate which is a temporary pointer to the current IP address of the corresponding peer. In order to provide a mapping between Members and Candidates, we create for every Candidate a list of Member instances seen at this address. In other words, once having found a Member at a specific IP address, we associate this member with the corresponding Candidate. Each candidate holds a list of timestamps to compare to other candidates and place them into different categories. Peer A computes the walk difference of peer B by taking the difference between the current time and receiving an introduction-response to an introduction-request from peer B. Peer B computes the stumble difference of peer A by taking the difference between the current time and receiving an introduction-request from peer A. Peer A computes the intro difference of peer C by taking the difference between the current time and receiving an introduction-response introducing peer C.
none when it does not fulfil the criteria for its assignment to one of the previously mentioned categories. We set both the walk lifetime and the stumble lifetime equal to 57.5 seconds because most NAT boxes close a punctured ‘hole’ 60 seconds after receiving the last packet. Moreover, we set the intro lifetime equal to 27.5 seconds because most NAT boxes close a punctured `hole’ after 30 seconds when no packets are received through it. The Dispersy code provides two main methods to obtain available Candidate instances: the dispersy_yield_candidates method returns an iterator with all walk, stumble, and intro-Candidate instances, in a randomised order. Note that intro-Candidates are unverified, i.e. we have only heard about their existence, but did not actually have any contact with them ourselves. The dispersy_yield_verified_candidates method returns an iterator with all walk and stumble-Candidate instances, in a randomised order. We call these Candidates verified because we have received a message from them at most 57.5 seconds ago (i.e. the walk and stumble lifetime). This means that, unless the peer went offine in the mean time, the peer is still there and the NAT has, most likely, not closed yet. Note that there are NATs that close within 57.5 seconds, those will not be reachable. Because of this, communicating with verified candidates is often better than using unverified candidates. the last time that this peer walked to this specific candidate, occurred at least eligible delay second ago. We have chosen 27.5 seconds for the eligible delay, with the exception of bootstrap candidates which require a 57.5 seconds of eligible delay. As a result, the bootstrap peers are not contacted to frequently. This feature was initially introduced to reduce the numbers of walks towards trackers in overlays with few peers. If one category is empty, the probabilities of choosing a peer from this category becomes 0. Malicious peers can easily pollute our neighbourhood by walking towards a peer from multiple distinct addresses and adding an arbitrary number of stumble-Candidates to its neighbourhood. To avoid such a neighbourhood pollution, we assume that a successfully visited peer is safe. Hence, half of the time we revisit such a peer (i.e. from the walk category) while the remaining 50% is evenly spread between the intro category and the risky stumble category. Method dispersy_get_walk_candidate implements this design. In phase 2 of the walk, peer B chooses a known peer C from its neighbourhood and introduces it to peer A. The dispersy_get_introduce_candidate method chooses peer C from the verified available candidates and returns it, or, when no candidates are available, it returns None. Using dispersy_get_introduce_candidate returns a verified candidate in semi round robin fashion. To this end each Community maintains two dynamic iterators _walked_candidates and _stumbled_candidates which iterate over all walk-Candidates and stumble-Candidates in round-robin, respectively. The selection process of a Candidate then becomes: 1. choose either the walk-Candidate or stumble-Candidate iterator 2. select the next Candidate in the iterator if it is not excluded, otherwise go back to step 1. In phase 2 of the walk, peer B determines the LAN and WAN address of peer A by using the UDP header (i.e. the sock_addr) of the incoming introduction-request combined with the WAN and LAN address as reported by A. We implement this in method estimate_lan_and_wan_addresses using a simple rule: when peer B sees that the corresponding message originates from its LAN, it decides that peer A’s LAN address is the sock_addr. If the message originates outside its LAN, then peer A’s WAN address is the sock_addr. Dispersy determines whether an address originates within its own LAN or not by checking if it corresponds with one of its local interfaces, with regards to its netmask. We do this using the _get_interface_addresses method and the Interface instances that it returns. Peer B uses the result of this estimation to update the lan_address and wan_address properties of the Candidate instance pointing to peer A. These values are also added to the introduction-response, allowing peer A to assess its own WAN address. To allow for changes in the connectivity, i.e. when running on a roaming machine that changes IP addresses periodically, we must remove older votes, by calling the wan_address_unvote method5, that may no longer apply. Dispersy does this by periodically (every five minutes) checking for obsolete Candidate instances. Where we consider a Candidate to be obsolete when the last walk, stumble, or intro was more than lifetime seconds ago, where lifetime is three minutes. This means that it can take anywhere between five and eight minutes before removing old votes. In Dispersy, nodes synchronize bundles by advertising their locally available bundles using Bloomfilters. The Bloomfilters contain the bundles which a sending node has received previously, allowing the receiving node to check for missing bundles. Included in the introduction-request messages is a Bloom filter which advertises the locally available messages of a peer. We only include a subset of all messages locally available in the Bloom filter in order to keep the false positive rate low. Moreover, as Dispersy is based on UDP we limit the size of the message which includes the Bloom filter to the maximum transmission unit (MTU) of the link in order to avoid fragmentation. IP fragmentation is caused by a router in the path having a lower MTU than the packet size. A typical MTU size on the Internet is 1500 bytes, for 802.11 it is 2304 bytes. We define message synchronization as creating consistency in a network of peers by resolving differences in messages received between two peers at a time. Peers regularly request missing messages by advertising their locally available messages using a Bloom filter. A Bloom filter is a compact hash-representation which allows for membership testing. Upon receiving such a request, a peer uses the Bloom filter to test if it has messages available the other has not.